YEREVAN, MARCH 27, ARMENPRESS. Exports of 16.3 million USD and investments of 46.8 million USD will be implemented with the support of the Development Foundation of Armenia: the board of trustees of the Development Foundation of Armenia headed by the Prime Minister Karen Karapetyan set the targets of 2018. 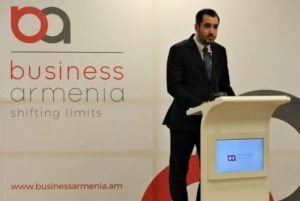 The new name and corporate style of the Foundation was also approved: from now on the Development Foundation of Armenia will function under the new name – “Business Armenia”, the DFA told Armenpress. This year, “Select Armenia” comprehensive e-platform will be created with the support of the Asian Development Bank, which will present Armenia’s investment opportunities and full export potential in its “Invest Armenia” and “Made in Armenia” sections. In 2018, the DFA will introduce the “Customer Relationship Management” system that will enhance t he effectiveness of DFA aftercare services for beneficiary companies. Moreover, the DFA Aftercare team will run a “Hot Line”, enabling faster response to the problems faced by investors and exporters. The eRegulations” tool of the United Nations Conference on Trade and Development (UNCTAD) will be installed within the frames of a grant program with a budget of 394 000 USD: the tool will be used to classify and publish detailed information on Armenia’s investment processes that will allow to identify the impediments to their implementation. The Fundraising team successfully completed financial negotiations to introduce the given platform and systems. The board of trustees of “Business Armenia” also approved the results of 2017. With the support of the Development Foundation of Armenia, in the past year, 75 Armenian companies attended 11 international exhibitions, established new business ties, as well as signed export contracts with a record total value of 5 billion 391 million AMD. This result is twice more than last year’s indicator, and as a result of each dram spent, the Foundation attracted more than 23 drams. Another 317 million AMD transactions were concluded as a result of 12 business forums organized with the support of the DFA. Throughout the year, the memorandums of 15.5 million USD investments were signed and re-investments of 3 million USD were made in Armenia through the efforts of the DFA. In 2017, the Development Foundation of Armenia underwent structural reforms: The Tourism component was subtracted from the scope of DFA work, turning it into a predominantly business-oriented structure. The member companies of the newly established Business Support Club will provide consulting services with no charge or at lower rates to producers and investors for a period from 2 months to term less. Dozens of companies have already taken advantages of logistic, legal, accounting, tax and business consulting services, and one new company with a foreign capital was registered. The DFA Aftercare team developed the database of 300 FDI companies, identified and solved 10 problems faced by the business community. The DFA hosted 19 business missions and carried out 3 outreach missions to Lebanon, Great Britain, and the USA. The Foundation received business delegations from Iran, Lithuania, India, Japan, Mexico, Switzerland, Russia, France. The DFA has created a network of representatives and today, through its 35 official representatives in 25 countries of the world, “Business Armenia” “speaks” with Businesses about Armenia in 16 languages.